The NT10G05, part of the NetTESTER family, is a powerful & versatile Ethernet Network Performance tester, operating at up to 10Gbps. 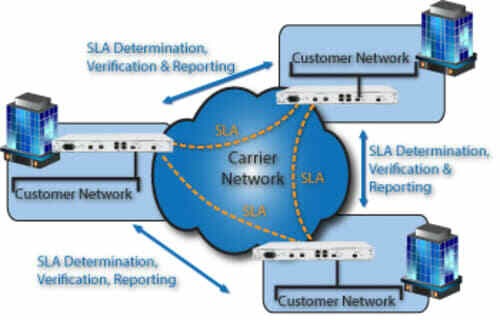 NetTESTER products are typically deployed, at network connection points, either by the Enterprise customers of Wide-Area Network Service Providers, or by Service Providers themselves, for verification of the performance characteristics of Carrier services. The NT10G05 is a device installed normally either in-line between the Carrier's termination device and the Enterprise LAN, or on a free port of the Enterprise Switch or Router. As an 'always-on' device, the NetTESTER platform is ready to be accessed on demand, locally or remotely, for testing purposes as and when required. Operating with both Layer-2 and Layer-3 addressing, the NT10G05 contains custom hardware for the generation of test traffic, loop-back (by packet-level Source/Destination address swapping) and analysis, to Industry-standard test profiles including RFC 2544 and ITU-T Y.1564. Users access the NT10G05 either via a local terminal or PC, or remotely across the network via Telnet/SSH or Web Browser, to con gure any unit as either a test traffic generator or line-rate loop-back point for Ethernet MAC or IP addressed test packets. Output can be viewed 'live' or automatically transmitted, on test completion, as a report via TFTP to a remote console. Optionally, the NT10G05 can be configured to operate whilst the network is 'in-service', providing real-time monitoring of jitter and latency between other points in the network via the use of ITU-TY.1731 (for Layer-2 traf c) or TWAMP ('Two-way Active Measurement Protocol', for Layer-3 traffic). SNMP 'Trap' alarms are issued to one or more Management stations should pre-defined 'Service Level Agreement' criteria fail to be met. By deploying Metrodata's NetTESTER family devices, standard tests such as RFC2544 and/or ITU-T Y.1564 can be instigated at any time between different segments of the WAN, with the results monitored remotely at the Network Operations Centre (NOC). The NT10G05 generates both Layer-2 (Ethernet MAC addressed) and/or Layer-3 (IP) test traffic and can also perform line-rate Source/Destination Address swapping loop-back, via Metrodata's custom 'MetroSAM' (Service Assurance Module) hardware. Optionally, by integrating the NT10G05 more closely into the network, using the ITU-T Y.1731 and/or TWAMP protocols, test units can be configured to provide background monitoring of network performance relative to pre-defined SLA criteria, providing alarms to the NOC in the event of a breach of contracted performance from one or more network. OTDR monitoring of critical point-to-point 'Ethernet over fibre' links of up to 1Gbps. 'RFC2544' profile testing could alternatively be used for individual Pt-to-Pt. links. TWAMP 'background' monitoring can be used to generate alarms to the Network Operations Centre in the event that (Latency, Jitter, Packet-Loss) becomes out-of-specification and breaches pre defined 'Service Level Agreements' for each link. If you require further information on the NT10G05 please contact our sales team.